Islamic Anniversary wishes : If any of your Muslim friend or relative is having a wedding or marriage anniversary, you should wish them a happy life in future. Also, send duas and congratulate them for made their Nikha successful. But choosing the right words for an Anniversary Wishes Messages is sometimes difficult. 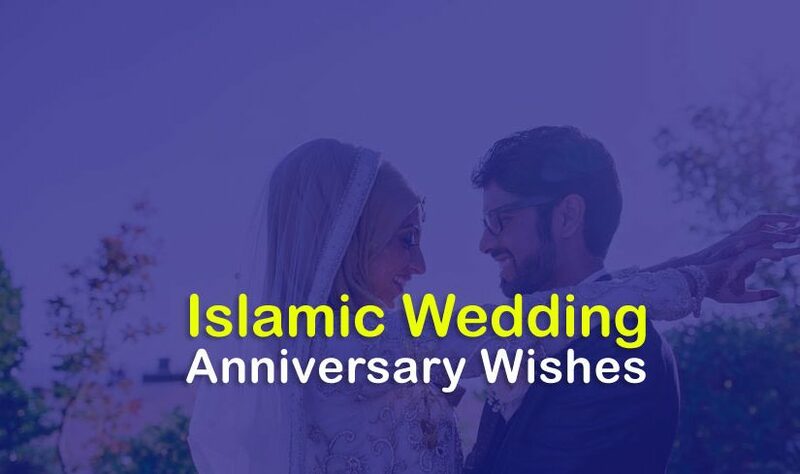 Islamic wedding or marriage anniversary wishes wordings are not like general anniversary wishes but it should be full of duas, blessings, and appreciation. For this special occasion, you need some special messages. 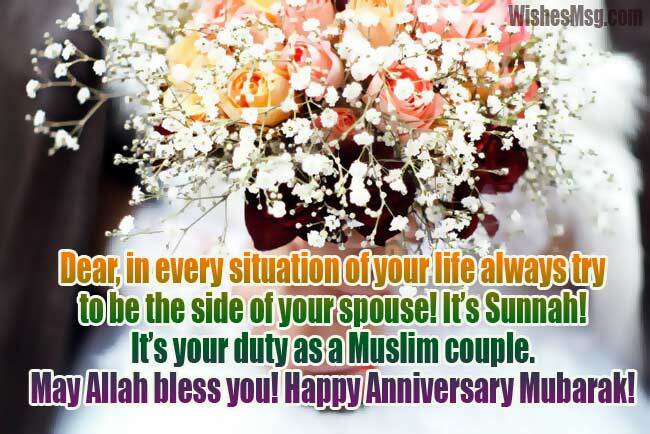 Here are some wonderful Islamic anniversary messages for Muslim couples. When you wish your close ones with these Islamic greetings messages, they just cannot help saying Shukran by seeing them and thank you for such amazing wish. To a lovely couple, I sent the heartiest congratulation and a lot of love for your anniversary. Happy Anniversary Dear! May Allah bless you and your spouse! Mubarak for your marriage anniversary! Always keep in mind that the person who always tries to raise your Iman is the best person in your life. I heard, from your spouse, you have started Namaz. You are the lucky one. Best wishes to you! A marriage becomes successful when you can live with your spouse in every situation. The situation may be good or bad that doesn’t matter. If you can do this that means Allah always with you. Happy anniversary dear! Its blessing to hear about your anniversary. Alhamdulillah! Stay together rest of the life. Our wishes are always with you! Barakallah! Alhamdulillah! You stay together! If you can stay together peacefully for the rest of your life, you may stay together hereafter in Jannah! Dear, my duas to you for a happy married life together forever. Happy anniversary both of you! Dear, you are the lovely couple I had ever seen! Barakallah! It seems that you both are made only for each other. Be happy always. May Allah’s blessings and protection be with you always. Wishing you a happy anniversary! May Allah bless you both. Allah unites you in one tie. I wish that Allah give you a pious, healthy and a beautiful child and you teach them according to Islam and make them perfect for Muslim Ummah! Happy anniversary dear! Always keep in mind that staying together happily is a kind of blessing from Allah. So, pray to Allah for staying together for the rest of life. Wishing you a joyous happy anniversary! Marriage is a very important part of our life. Every person can’t deal with it properly. You guys did it beautifully. So I want to congratulate you once again. May Allah bless you! Happy anniversary and wishing you a happy life! Dear, I become very glad to know about your anniversary! And eagerly waiting for an anniversary party! By the way, May Allah bless you! I’m praying to Allah for your happy life. Anniversary Mubarak! Oh, Allah! Keep the most beautiful couple in peace. You are the Merciful! Please put mercy in their heart! Nikka Anniversary Mubarak to both of you! Almighty made you the most beautiful couple in the world! You should pray for such valuable gift! You are the lucky couple. Always keep in mind that staying together is the blessing of Allah! Stay happy always! Anniversary Mubarak! Our creator! There is a wish of mine! Today is the cutest couple’s anniversary. So, increase their love for each other and make their bonding stronger than before. Dua for peace and happiness in your home! Oh, Allah! You are the greatest creator. Please, make the couple so loving as they will be the ideal example of a loving couple for whole Muslim Ummah. Give them love, faith, and happiness in the world and in Jannah! Dua for peace and love in the family! Allah, keep your blessings upon this loving couple as they can stay together rest of their life! May you have a very happy life with each other! Always love each other Dear. Happy Anniversary blessing to both of you! Today I had noticed that everything is getting changed. Can’t understand anything. It looks like the soft air, the sweet sound of birds, the fragrance of flowers all are announce something. Yes, it’s your Nikkah Anniversary Mubarak! Dear, in every situation of your life always try to be the side of your spouse! It’s Sunnah! It’s your duty as a Muslim couple. May Allah bless you! Nikka Anniversary Mubarak! Islamic wedding and marriage anniversaries are holy events and very respect among the Muslims. So don’t forget to make sure your messages hold the same spirit.